Drupal is among the most popular CMS’ currently available and is the preferred choice for government agencies, large associations, nonprofits, and many Fortune 500 companies. Simple for editors, powerful for administrators, secure, and accessible for everyone, Drupal is a one stop shop for all of your website needs. Popular sites using Drupal include United Institute of Peace, General Electric, eBay, The Economist, NCAA.com, HHS.gov, The Weather Channel, Tesla Motors, and Louvre Museum. See the full Drupal Showcase. For many of the reasons laid out in this page, Drupal is an ideal CMS for Government agencies, nonprofits, trade associations, publications, foundations, and large corporations. Drupal is well suited for complex, content heavy, and high traffic websites, as well as those with large resource libraries and databases. Writers, editors, and site administrators can contribute to a Drupal site with no HTML or coding experience due to the simple WYSIWYG (What You See is What You Get) editor. Drupal’s WYSIWYG interface allows for writing, editing, and adding content as easily as in a Word document. Using simple menu buttons, you can also add images, formatting, and hyperlinks. Drupal sites are highly customizable, featuring a Lego-like framework that can be built to exact specifications. Drupal boasts a large user community, with thousands of designers contributing to the module library. There are modules for a wide variety of website features, including ShareThis for social media, Image Effects for photo editing, calendar plugins, CAPTCHA, Google Analytics, and meta tag plugins. The most recent upgrade from Drupal 7 to Drupal 8 made the integration and use of contributed modules easier and even better than before. There are tens of thousands modules currently available for nearly any website need you could imagine. A responsive design build allows for seamless content viewing across various devices. With 77% of Americans now owning smartphones, a mobile accessible site is more important than ever. Drupal and the related modules allow you to be confident that your site will work seamlessly on any number of devices, whether at home, at the office, or on the go. 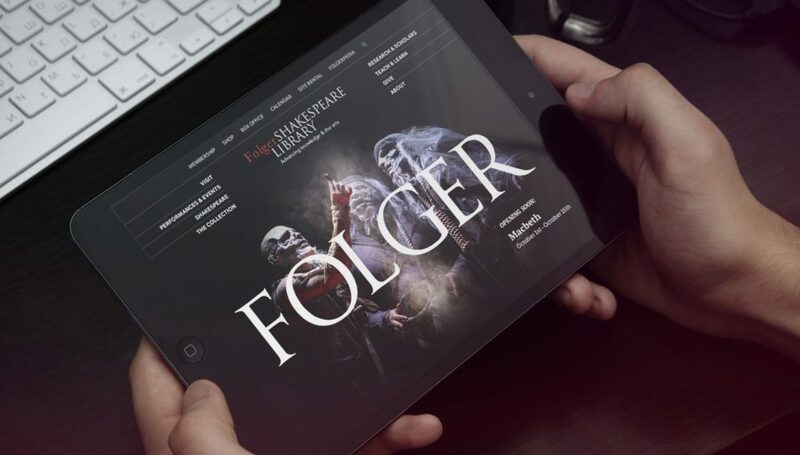 Folger Shakespeare Library caters to a wide breadth of audiences with a customized Drupal website and revitalized digital presence. Is a Technical Background Needed? In short, no. Drupal’s frontend is optimized for easy use for content managers, writers, editors, and company leadership. The technical aspects of Drupal are handled on the backend by the team you hire to design and build your site. Admin Toolbar – Replaces the popular admin menu module in Drupal 8, providing responsive rollover menus. Backup and Migrate – Helps to easily schedule database backups for your Drupal site. Field Group – A helpful module for organizing your content types. You can organize fields into tabs, accordions, and more to give your content editors a better experience. Google Analytics – A simple module to let you configure Google Analytics in Drupal and track your users and pageviews. Linkit – Simple and easy to use for adding links to your site. Metatag – Designed to configure your site’s meta tags. Redirect – Almost every new site needs to incorporate a large number of redirects for old page URLs. The Redirect module makes it easy. Simple Sitemap – Helps create XML sitemaps for search engines. PathAuto – Automatically generates relevant and easy to remember URLs for pages. BigPipe – Helps speed up page load times to avoid losing users. ShareThis – Allows you to add social media buttons for easy sharing across different sites. You will find many navigation and menu modules to help create a flexible content architecture. This allows you to easily organize a large, content-heavy website. Our work with Learning Without Tears illustrates how to create flexible layouts on Drupal while providing detailed examples of complex integrations and custom search solutions. The Panels module in Drupal allows developers to create customized layouts for numerous uses, letting you create more sophisticated ways to display your content. Apache Solr can be used in place of the core search module on Drupal for enormous gains in power and speed. The search functionality alone is one of the most compelling reasons to use Drupal over other CMS’. Both high and low traffic sites with large databases can be slowed down by poor search functions that create a bottleneck. Apache Solr also enables complex searches, indexing attachments (like pdfs) and searching on multiple sites. A great example of using Apache Solr for in-site search can be found on World Shakespeare Bibliography, now showcasing more than 120,000 records. Drupal can also accommodate Swiftype, which is run on Apache Solr as a SAAS service. Drupal is highly flexible and allows for integration with third-party APIs (application programming interface) as well as the creation of your own API endpoints. An API allows you to communicate from server to server in order to exchange information such as published content, user information, or rich media. Drupal also makes SSO (Single Sign-On) with other systems simple using OAuth like Google Apps or a SAML-based integration like Salesforce. SSO allows a user to use one login across multiple sites without sharing your password across these sites. Essentially, you can login to one site and be authenticated to access many different sites without needing to log in to each one. APIs and SSO are critical in making your website work seamlessly with popular third party platforms like SalesForce and Netforum. On Learning Without Tears, we integrated Plus Live Insights to handle cumbersome product licenses for educators so they could focus on teaching instead of paperwork. Drupal also has the ability to “run headless,” meaning you can publish content to Drupal’s powerful tools and see it as a notification on an entity like an Apple Watch or billboard. This provides additional flexibility by incorporating new functionalities which support Drupal’s status as a leading CMS. Drupal has key modules designed to handle content migration, even for large sites. While a developer could manually migrate all content on a small site, such migration is risky for a large, content-heavy site. This module allows for a systematic migration of all of content without the risk. Our work with the United States Institute of Peace demonstrates how the information architecture team migrated and reorganized USIP’s content to be more intuitive and user-centric. Drupal 8 has new features that make it easier than ever to use, including new fields, new field locations, and simplified field names. It also uses CKeditor, an updated and simplified text editor that makes posting content more like editing a Word document, as well as a Quick Edit feature and responsive images that allow for easy resizing. There is also a helpful Tour button to guide you as needed. Drupal has made multilingual sites much easier to manage with four key modules added to the core. Drupal’s most recent upgrade has made key functionality improvements. Many of the best modules have now been moved into the core, and Drupal has also made it easier to use contributed modules. Drupal has shown huge and meaningful improvements with each upgrade, dramatically increasing its usability and power. Drupal 9 is on its way with a schedule release of June 2021 – full details can be found here. Drupal is highly scalable, making it popular with large and complex organizations that have high traffic sites. Drupal improves website performance through caching, especially for logged-in users, reducing page load times and resource requirements. Drupal has multiple types of opcode caching add-ons for PHP that can provide a substantial benefit to a slow site and greatly reduce CPU usage (process time). If implemented correctly and maintained properly, Drupal has proven to be a secure open source CMS with framework applications. Drupal is mature, stable, and designed with security in mind; for this reason, many large organizations rely on Drupal as the main CMS used to power their websites or web applications. Drupal has one of the best security teams available, advanced hosting providers, and one of the largest open source community of developers contributing to the CMS. Large hosting providers are investing millions in web hosting infrastructures to power some of the world’s largest Drupal websites. When exploring Drupal, consider hosting providers such as Blackmesh.com, Acquia, and Pantheon. Drupal is an open source platform that has a large user community which regularly contributes to repositories like GitHub. By virtue of the sheer numbers of developers and designers working on Drupal, there is a broad knowledge base contributing code and participating in Drupal groups on LinkedIn, Subreddits, and more. Because of this, there is always an answer to your next Drupal question. The average cost structure of a Drupal build is about $50k-$75k for medium-sized websites and $75k-$500k for large enterprise sites. The cost considerations for Drupal can include strategy, design, and implementation. While WordPress is an excellent CMS, Drupal is often the best choice for complex, content heavy, and high traffic websites, as well as those with large resource libraries and databases. Drupal is extremely powerful, flexible, functional, and secure. In general, Drupal is more suited to large and complex sites. WordPress may be slightly easier to use, but it lacks the depth and power that many large businesses and agencies need in a professional site.